We have an older home and almost walked away from it when the realtor pulled up to the drive way prior to buying it. I remember my wife saying one solitary word when we stopped in front of our home: “No.” she said as we sat there staring at our future home. Little did we know what awaited us inside the house. The previous owners were evidently aware of the lack of curb appeal which worked to our advantage because the previous “home shoppers” were too put off to see the potential and the renovations done inside. Once we came in, my wife and I were smitten with the amount of love and effort that had been put into the living space inside. My wife’s tone quickly changed from disgust to pleasant spats of glee as we went from room to room. She tends to clap when she gets excited about things. Until recently, we have rented for the past 10+ years. We have always had thin carpet in the homes we lived in because (I assume) it is cheap to replace. I didn’t know what nice carpet felt like until we walked through our soon to be home. I love taking off my shoes after work and just mooshing my toes into the cake like carpet we have now. It’s so thick that it is difficult to vacuum but that’s ok it is extra effort I am glad to put in. There were some changes I wanted to make but I like projects so we bought it. One of the things I wanted to do was replace the vinyl flooring with tile. One of the places that offered a great selection was TileMarkets . They offered many options of different flooring types and some of the most competitive prices I found on the web. With so many options for flooring these days, it is sometimes difficult to look at all of them. Some of these flooring trends involve at least a little bit of work. We are fans of wood flooring (though as I’m discovering, every speck of dirt shows up so cleaning is a daily event). We really like dark woods but as I said, dirt tends to love it too because it shows every piece of it. We are also fans of the large flooring tiles. We haven’t found a way to incorporate both in the same space so that it doesn’t look cluttered so we have opted for tile in the bathrooms. It gives a nice transition from one texture to another and since we chose neutral colors to compliment the wood flooring in the rest of the house, there is no shock to the senses moving from one room to the next. 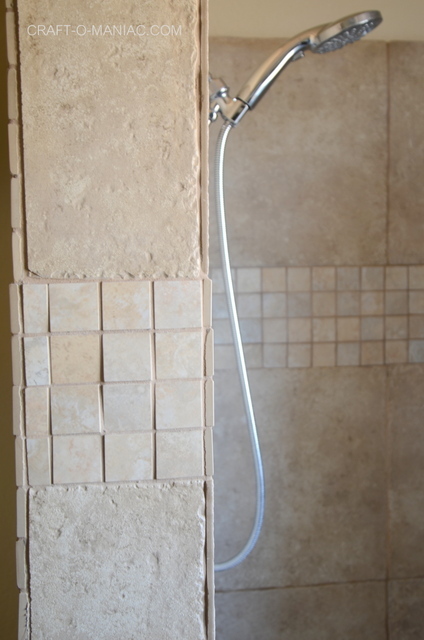 We chose tile with a rougher texture to it to replicate stone. You can see it in some of the shadowing of the tiles in the pictures taken. I looked at what some other people had done using tile in their shower. While putting tile in your shower is definitely not a new idea, it was new to me so I tried my hand at it and it turned out pretty good. 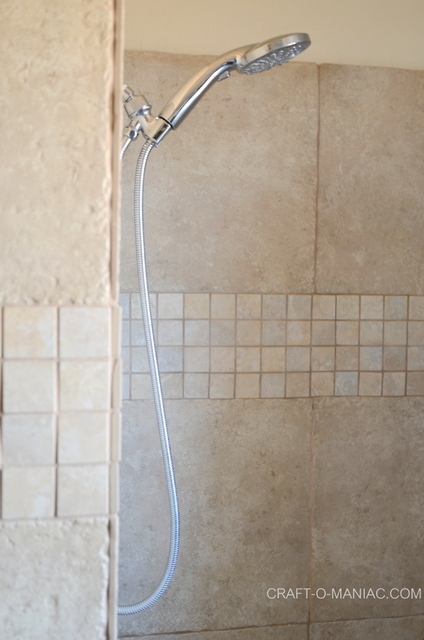 As I said, we wanted to keep the colors neutral so the bathroom would have a “spa” like feel to it. Further, I placed the same tiles on our bathroom floors to tie it all in together. The downstairs is the next project on my list. I started here with the floors because this room doubles as our laundry room and having the washer and dryer in living space brought the constant flow of laundry to a halt. That couldn’t go on for very long. The cabinets were already installed and some previous owner painted them black and stressed the paint making them look somewhat rustic. It was and interesting way to update cabinets without replacing them. They looked like brand new cabinets. It was actually one of the reasons we liked the house so much. This made a more neutral tile color more rational as well. We are very happy with the final product especially with the way it compliments the rest of the house. Mad props to all of you who have undertaken this project as well because it is a doosy and a dusty mess. Lot’s of cuts and for the beginner like me, re-cuts. On the up side though there is always a sense of pride doing anything to your house. It doesn’t seem to matter whether it’s a major or minor project. It all seems to generate the same amount of pride in whatever we’ve done to improve our home. I’m sure you are familiar with what I’m talking about. Although, I will say that for major projects I do seem to brag a little more when it’s finally done and polished. If you have any critique or comments, we are always excited to hear from you. I’d love to hear about your experiences as well. I’d love to hear your success stories and trials you’ve overcome. Thank you to all of you for your support and love. Have a wonderful day and keep crafting you Maniacs. I am just about to start bathroom reno and came across your photos, I will definitely use these beige tiles on the wall, they look soothing.